The largest point increase ever seen with tradelines. Did you ever wonder how high your credit scores can go after adding tradelines? How about 754 points? Yup, it’s true. But, don’t expect the same results unless you and your credit fall under the same conditions. Everyone knows that adding tradelines increases credit scores. Well, when done correctly, anyway. People often search in Google to determine how high their credit scores will increase after adding tradelines. In the case below, you will see before and after credit reports. The before: no credit score. Here’s the credit report before tradelines. Here’s the credit report after tradelines. (Note: It’s only three pages, but you can scroll right and left to turn the PDF page). Disclaimer. The purpose of this post is to show what’s possible under particular circumstances. 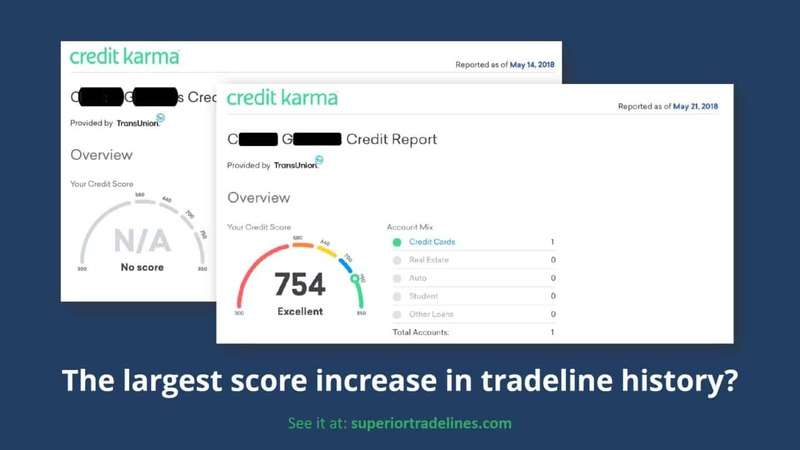 You can expect this credit score increase from adding tradelines, only if you bought the same tradeline and only if you have the same exact credit circumstances as the consumer described below. Some companies mislead by multiplying the results by three. For example, suppose you received a 32 point boost after adding tradelines. Some companies will say you received a 96 point boost (32 for Experian, 32 for Equifax and 32 points on TransUnion). This is a ridiculous misrepresentation because it could lead a consumer to believe their score increased by 96 points. When a lender breaks the bad news, the consumer may be more than disappointed. In the case of this post and the score impact presented, the 754 points were TransUnion to TransUnion. It was the actual points. It was not supplemented by the points from the other bureaus. Clarification on the 754 point boost. While this is not a misrepresentation, the 754 points boost requires clarification. Technically, no credit score is not the same as a zero credit score. I don’t know if anyone’s ever had a zero credit score. It’s like the old adage that you get points on a test for just writing your name correctly. It’d be pretty hard to have a zero credit score; you probably get some points for just having a name. Also, and more importatnly, most credit scores start in the 300s, not 0. But, no credit score simply means that the credit scoring modelers have no basis to evaluate you. In other words, it’s not that you have a bad credit score (i.e., 0), but that you have insufficient credit to have a credit score at all (i.e., no credit score). So, whether this was a 754 point “increase” is up for debate. However, it is 100% factually accurate that this client went from no credit score to a 754 credit score. Also, the score could be higher than that on a legitimate hard pull credit report (pulling real FICO scores). How high can your score go? If you’re curious how much your score could increase by adding tradelines, there’s really only one way to find out: Call us or get started here, so we can evaluate your current credit situation and give you a recommendation. Previous Post Convert tax refunds into a better credit score. 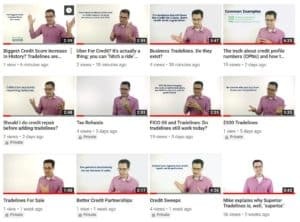 Next Post A credit hack that’s not nonsense.